Please join Syracuse Children’s Chorus (SCC), under the direction of Artistic Director Stephanie Mowery, Associate Director Katherine Dee Medicis, Director of Tenuto (Young Men’s Ensemble) Da’Jon James, and pianist Maryna Mazhukhov, for the opening concert of our 35th season. The concert will be held Sunday, Oct. 25, 2015, at 4 p.m. at the University United Methodist Church, 1085 East Genesee St., Syracuse. The public is invited to experience the magic of Nick Page, extraordinary composer and song leader. 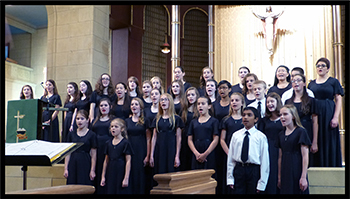 Page will join all four choirs of SCC to sing the history of Syracuse through songs of freedom and peace. The chorus will also premiere an exciting new work by Page that features guest school children from the Dr. Weeks Elementary School, Syracuse City School District. Known for his boundless enthusiasm and ability to inspire singers of all ages, Page will lead a magnificent group sing that will transform the audience into joyful, expressive and energized singers. Don’t miss this unique musical extravaganza! Concert tickets are $22 for adults, $20 for seniors and $10 for children, with general admission seating at $18/$15/$10. Parking will be available in lots across from the church on University Ave., or on the street. The concert is sponsored by SCC. For more information, contact Bethany Harris, operations manager, 315-478-0582, or bharris@syracusechildrenschorus.org, or visit http://syracusechildrenschorus.org/.